Do your New Year resolutions include healthy eating or being more organizer? 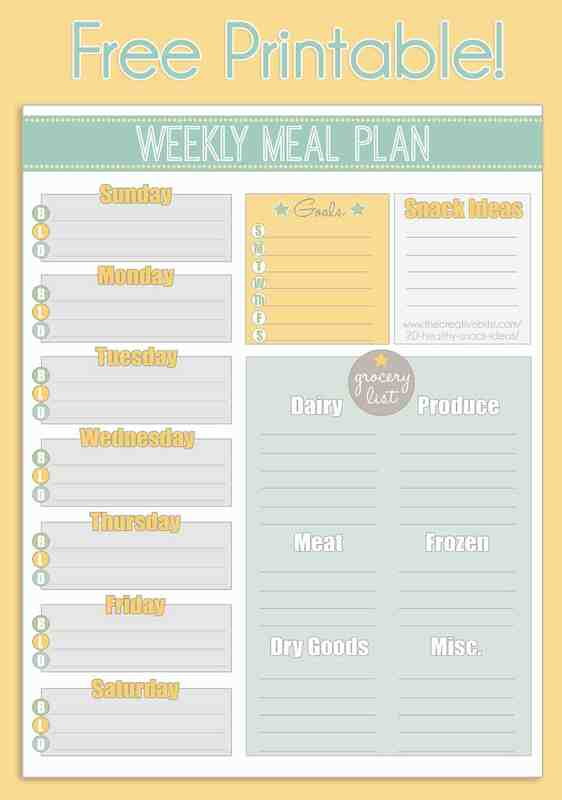 If they do, I have got you covered with this Free Printable Weekly Meal Planner and Calendar! This meal planner has everything you need to keep track of your snacks, breakfasts, lunches and dinners for the week as well as a convenient spot to make your grocery list. It also has an area for your weekly goals. Whether you are aiming to get 10 glasses of water in a day, make a workout plan or have a small personal goal in mind for the week, you can customize this to fit your needs. Eating healthy is so much easier when you make a plan for the week. You can buy all of your groceries in one organized shopping trip and even do some meal prep ahead of time. Meal prep is great for people who are rushing home to get dinner on the table with a hectic schedule or kids running around. You don’t need to make all of your meals ahead of time, but by prepping some ingredients like peeling and chopping squash, it will save you time during the week. If you are looking for healthy meal inspiration, be sure to check out our Healthy Weekly Meal Plans! They are filled with nightly dinner ideas as well as an occasional snack or treat that is lightened up. Use the entire meal plan for a no-brainer menu, or pick it apart and make it your own to suite your family. Whether you print and three hole punch these Free Printable Weekly Meal Planners and keep them in a binder or display them in your kitchen on cute clip boards, they are such a useful tool for organizing your menus. You can customize the calendar to your needs for the month. 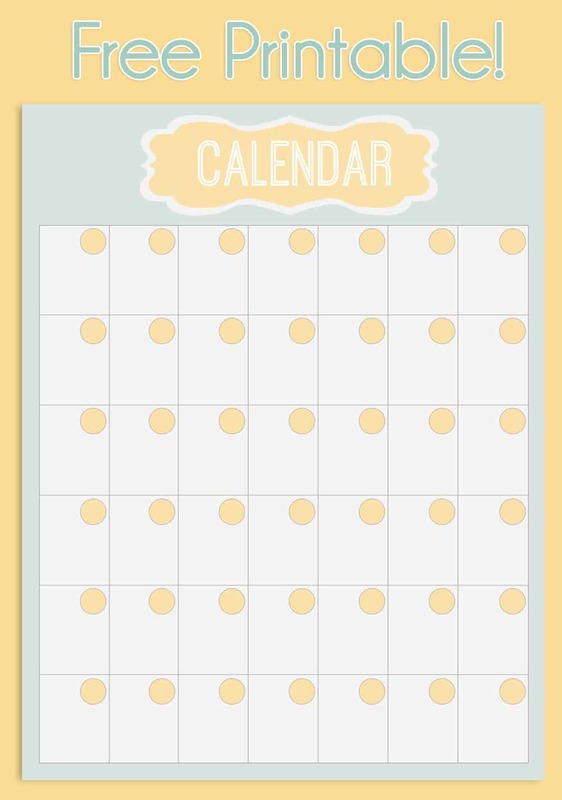 Use it to plan out a month’s worth of meals or just use it in conjunction with the meal planners for a coordinating calendar to mark down all the important events in your life. Download your Free Weekly Meal Planner and Calendar here! Love this! So helpful to stay organized! A great tool to have around the kitchen! Printed! Here’s to hoping I can get organized! Thank you so much for this! We are doing a weight loss challenge at work, and I can’t wait to share this with them! So far it’s 20 people! This is lovely! I love how this is laid out! Thanks so much Elena, I hope you find it helpful! How did you create the meal planner? I really like it. I’d want to make a few changes. I have Word and Excel but I’m thinking you used something else for bubble letters. Any Suggestions is greatly appreciated! I created it in Photoshop, so unfortunately its not something you can edit. Fantastic, thank you for providing this so i didnt have to create one myself!! SAVER!! !